The European far right has cynically appropriated left-wing and pro-worker talking points for its own purposes. Thirty years later, his daughter Marine, who succeeded him as leader in 2011, is calling for the rich to be taxed, criticizing the impacts of global “ultra-liberalism,” and arguing that a strong “strategist state” is the only way to fight the increase of inequality. Across Europe, anti-immigration parties such as the National Front in France, Geert Wilders’s Party for Freedom (PVV) in the Netherlands, and UKIP in the UK present themselves as the only real defenders of the working class. Much like Donald Trump, they have made significant gains in working-class areas suffering economic decline, and have even overtaken social-democratic parties in working class votes. To achieve this, many of them have donned left-wing clothing: opposing privatizations, defending welfare entitlements, and advocating for the reigning in of finance. For most of these parties, this is a radical shift from the libertarian agenda they pursued in the past. However, their apparent turn to the left on the economy is largely window-dressing: when voters aren’t watching they are often found lining up with business interests and attacking workers’ rights. Wilders, for his part, was a protégé of liberal politician Frits Bolkestein, a proponent of Reaganomics who went on to push for a radical deregulation of the European labor market as European Union commissioner. He is widely remembered for a directive proposing to allow companies to employ workers in one country (say Luxembourg) and pay them the salaries of their home country (say Poland). For anti-establishment parties, particularly in social-democratic Europe, free-market economics once offered an insurgent quality. Lowering taxes, shrinking government, and privatizing public services were advanced as a way to remove power from those controlling the state. In the 1980s, Le Pen saw Reaganomics as an opportunity to challenge the French political elite, which oversaw a large welfare state and government-owned industries. Geert Wilders, founder of the Dutch Party for Freedom, saw a similar appeal in US-style fiscal conservatism. In 2005, after he defected from the VVD, he went on a study trip to the United States where he met with Grover Norquist, the Heritage Foundation, the American Enterprise Institute, and the Libertarian Party. He recognized limits to how far this agenda could be imported to Europe, but made a connection between his anti-immigrant agenda and tax cuts: since immigration increases demands for social security, he reasoned, cutting it can lower taxes. Because there was no Dutch party advocating radical tax cuts, there was an opportunity for him to combine an anti-immigration and anti-tax agenda, and for his party to appear as more than an anti-Islam fringe group. But by the time 2011 came around, with the economic crisis in full swing, a similar fact-finding mission for Marine Le Pen had a more limited impact. While she found common ground with libertarian congressman Ron Paul on foreign policy isolationism, she was far less taken by his economic ideas. The National Front’s economic program was, by this time, widely divergent from libertarian positions. Today, it features measures to increase pension benefits for the elderly, cut taxes for the three poorest deciles, increase credits for those on low incomes, introduce price controls on gas and electricity, maintain the maximum working week to thirty-five hours — a measure established by the Socialist Party in the 1990s — and sanctions for CEOs of large companies who engage in cartel-like practices. Statements in party manifestos on welfare. The National Front has made the most conspicuous moves to the left of all the radical right parties, but others have also diverged from their free-market roots. UKIP is a striking recent example. Its new leader Paul Nuttall once advocated the privatization of the public National Health Service, writing that “like all state monopolies, it is costly, inefficient, and stuffed with bureaucrats,” and that its existence stifled competition. 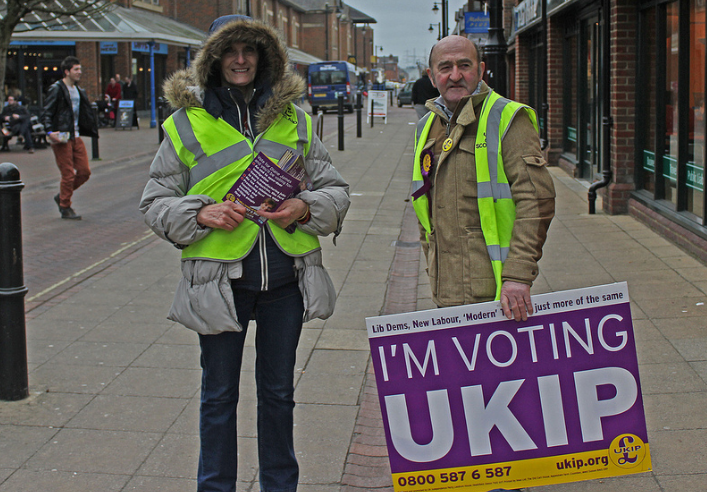 After he succeeded Nigel Farage as leader he reversed his earlier position, committing to keep the NHS public and even making it one of his central issues in the Stoke by-election. Where once UKIP championed a (regressive) flat tax, and proposed scrapping the state pension system, today it supports progressive taxation, and campaigns to “protect benefits.” This reversal fits well with its new electorate. Polling shows that 79 percent of its voters support the nationalization of energy companies, and 73 percent back the nationalization of railways. This rebranding of the radical right has occurred at a moment when it is increasingly attracting working-class votes. Blue-collar workers are the social group where Marine Le Pen enjoys the highest level of support (at 44 percent) for the upcoming French presidential election. They constitute the single most important group in the National Front’s electorate. This is tied to fundamental changes in patterns of class voting in Europe. For much of the twentieth century, a clear political divide existed between the bottom and the top of the social hierarchy. By and large, the working class voted for social-democratic and communist parties, and the managerial class and petty bourgeoisie supported liberal and conservative parties. Since the end of the 1980s, however, these class-party alignments have considerably changed. The blue-collar working class has massively deserted the social-democratic parties and opted either for abstention or the radical right on the basis of concerns about immigration and globalization. Throughout the industrialized world, differences in turnout between rich and poor have increased, making low-income groups less attractive for party strategists and, in turn, more difficult to mobilize. Social-democratic parties in Europe have drawn less and less on the manual working class. In their most successful incarnations they have been able to rely on the votes of the growing base of middle classes employed in the public sector and in creative industries. More commonly they have become unsuccessful “catch-all parties” attracting middling level of support among various classes but without the capacity to mobilize any of them effectively. In the meantime, with center-left parties moving away from them, many working-class voters have turned to parties proposing economic and cultural security through nationalism rather than social democracy. There are many examples of this change in the link between class and party. Henin-Beaumont, a former mining town in the north of France, had been controlled by the Socialist Party for seventy years. It became the flagship municipality of the National Front when it elected a far-right mayor in 2014. In the former “red banlieues” of Paris, historically controlled by the Communist Party, the FN has made significant advances, even if it is still far from matching the levels of its historical stronghold of the Cote d’Azur and de-industrialized north. In our research, we analyzed the share of working-class voters in the electorate of radical right parties in seven countries, looking not only at workers in manufacturing and trades, but also at service workers. Lower-skilled jobs in services, often occupied by women, constitute now an even greater share of employment than manufacturing in most countries. Employment conditions in these sectors are usually worse than in manufacturing, where workers can rely on a longer tradition of union mobilization. 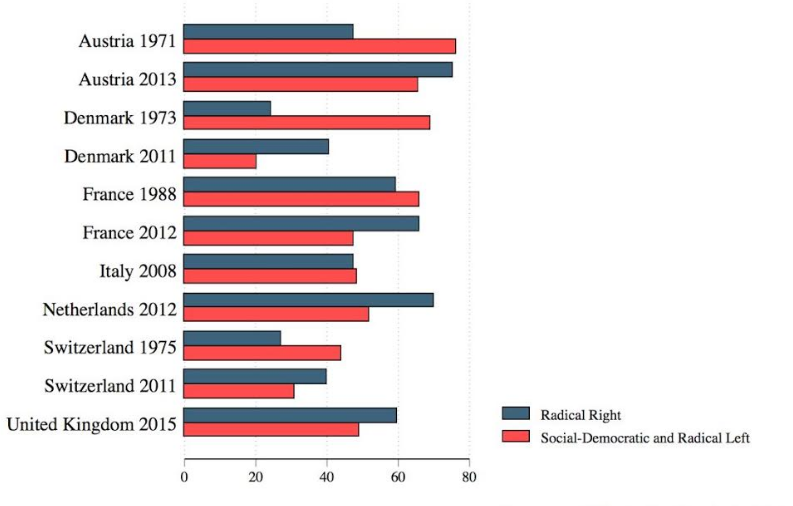 In nearly all the countries we looked at, the proportion of working-class voters within the electorate of radical right parties increased over time. Working-class voters now represent between 60 and 75 percent of the radical right’s electorate in Austria, France, the Netherlands, and the United Kingdom, while they represent only between 44 percent and 54 percent of all voters in these countries. We also found a clear overrepresentation of workers among the electorate of radical right parties in Denmark and Switzerland. The Lega Nord in Italy is an exception, as it is the only party where workers are not overrepresented. On the other hand, the proportion of working-class voters voting for left-wing parties has declined. In several countries workers continue to be overrepresented among the electorate of the left but today there are often more working-class voters within the electorate of the radical right than among the left. If one considers in a different but complementary perspective the voting behavior of the working class (and not only the parties’ class composition), new patterns of class voting also emerge. Production and service workers give a clear above-average support for the radical right, while this is not the case for the Left. In a sample of nine European countries, 31 percent of production workers and 25 percent of service workers voted for the radical right on average in the period 2002–2014, while it gathered only 18.8 percent of votes within the population as a whole. The difficulty of the center-left to mobilize its core electorate is not surprising. The turn of social-democratic parties towards the Third Way policies championed by Tony Blair and Gerhard Schröder in the 1990s has left widespread disillusionment in its wake. But the increasing focus on issues of identity has also been a factor, and all the more striking when compared with the recent turn of the radical right to issues of economic security, a reorientation that coincided with their recent success. This leftist rebranding of far-right parties should not be taken at face value, however. There is a gulf between what they say and what they vote for. Even when their program and rhetoric claim to defend working people, the radical right often sides with capital when it comes to legislation. At the same time, its senators fielded amendments to remove representation rights for workers in small firms, remove the obligation to provide training, cut the ability of workers in strenuous jobs to claim early retirement, and cut taxes on extra hours. They then attacked union rights: asking to remove the monopoly of unions in wage negotiations, which would make it possible for firms to negotiate wages with nonunion groups. In the end, the amendments were withdrawn and parliamentary assistants blamed for them. When unions organized mass demonstrations against the law, Marine Le Pen first called for them to be banned (France was officially in a state of emergency after the Bataclan attack), only later recognizing their “legitimate right to protest.” By then, she knew that the majority of her own voters supported the protests. This double discourse is widespread within the radical right, which claims to represent both workers and the petty bourgeoisie — constituencies with opposing interests. In the run-up to the 2010 elections, Geert Wilders claimed that increasing the mandatory retirement age was an issue he would never compromise on. The day after the election, he said that this was no longer a stumbling block to coalition negotiations. Later on, he was reported to have said in private that this gambit was only aimed at pulling support from the Socialist Party among working-class voters. Even when Wilders claims to represent ordinary people, his party often votes for policies that benefit the rich. For instance, the PVV has been a strong defender of tax rebates for homeowners. As well as contributing to making Dutch households the most indebted in the industrialized world, this rebate has been shown to benefit the richest 20 percent of households, which benefit to the tune of half of the total tax cut. His party also opposes collective bargaining and union rights. Most Dutch workers are covered by sectoral collective bargaining where the government extends the terms of negotiations between employers and trade unions to be compulsory for all workers in an economic sector. The PVV has proposed to dismantle this system, leaving individuals to negotiate with their employer alone. This trend is repeated across Europe: in Switzerland, the Swiss People’s Party claims to protect Swiss workers from immigration, but strongly opposes sanctions for employers exploiting immigrants. Its MPs have illegally employed asylum seekers without paying taxes. In Austria, the Freedom Party (FPÖ) supported a raft of laws to weaken the unions and deregulate the labor market while in government between 2000 and 2007. This should not be surprising for a political tradition which defends an agenda that is hostile to the collective solidarity embodied by union rights and collective bargaining. The type of solidarity that radical right parties advocate is subordinate to nationalist and conservative values. Whereas the Left campaigns for expanding the welfare state, the radical right most often talks about cutting it: limiting social benefits to nationals, or as Wilders’s PVV proposed, opposing child benefits for families of more than two children because Muslim families are believed to have more children. When it comes to social entitlements, they have been longstanding supporters of a punitive approach to welfare. The local chapters of the PVV in Rotterdam and the Hague want to force unemployed people to work in greenhouses to replace immigrant workers. It is clear that the working-class vote for the radical right has increased alongside a shift from free-market to leftish economic platforms. But much of this shift has been rhetorical. 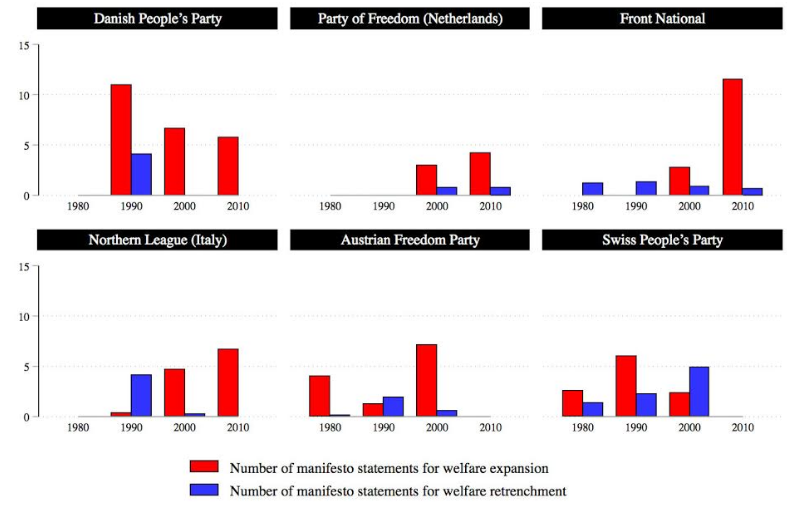 In practice, radical right parties in Europe mostly function to convert working-class votes into right-wing policies. Their true pro-capitalist nature only comes to light in cabinet meetings or in legislative committees, when voters aren’t paying the same attention. This game has limits, however. Voters cannot be tricked indefinitely. After its first period in government the Austrian FPÖ lost two-thirds of its seats. The PVV lost a third after it supported a conservative cabinet committed to implementing wide-ranging austerity. Their electoral support is volatile, and this goes some way to explaining their shift to the left on the economy. Most radical right voters are primarily concerned with immigration — and many do not even know their parties’ positions on the economy. But if they are ever to move beyond a single-issue demographic, they will need a broader social message. This rebranding exercise can and must be prevented. The migration of working-class voters to the radical right is an immediate concern for the Left, which must be countered by re-engaging with workers, the historic base of progressive politics. In this sense we should look to examples in Spain and Portugal, where the far right remains marginal, and where left parties have been able to mobilize a strong anti-establishment vote. Alexandre Afonso is an assistant professor at the University of Leiden, Netherlands. Line Rennwald is a postdoctoral researcher at the European University Institute in Florence.